I am not a fan of rankings. ZappyLab built PubChase because of our intense dislike of the impact factor (metric commonly misused and abused in academia to judge the quality of research based on the journal where it is published instead the quality of the article itself). Two years ago, I put a lot of effort into Thoughts on Choosing a College to argue that undergraduate college rankings are mostly meaningless and a terrible metric for parents and students in choosing the right institution. 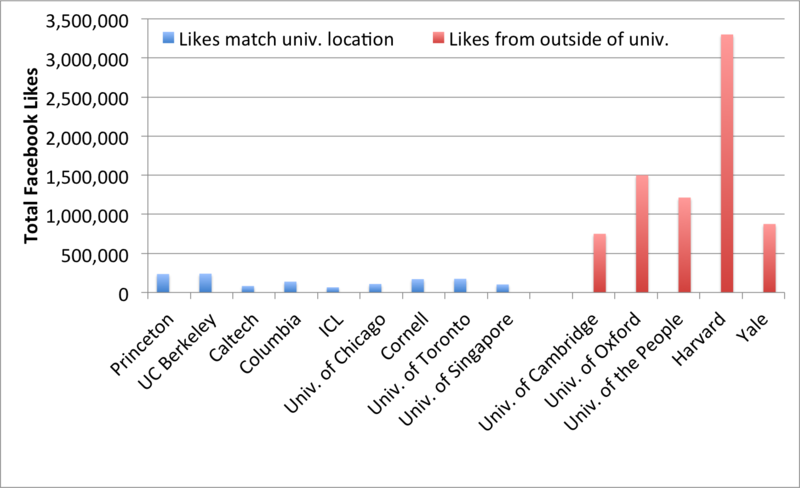 So, it is not surprising that the recent report "Where are the most popular universities on Facebook?" did not impress me much. A toxic combination of rankings and Facebook popularity, particularly in light of my editorial on fake Facebook "likes" that plague companies . 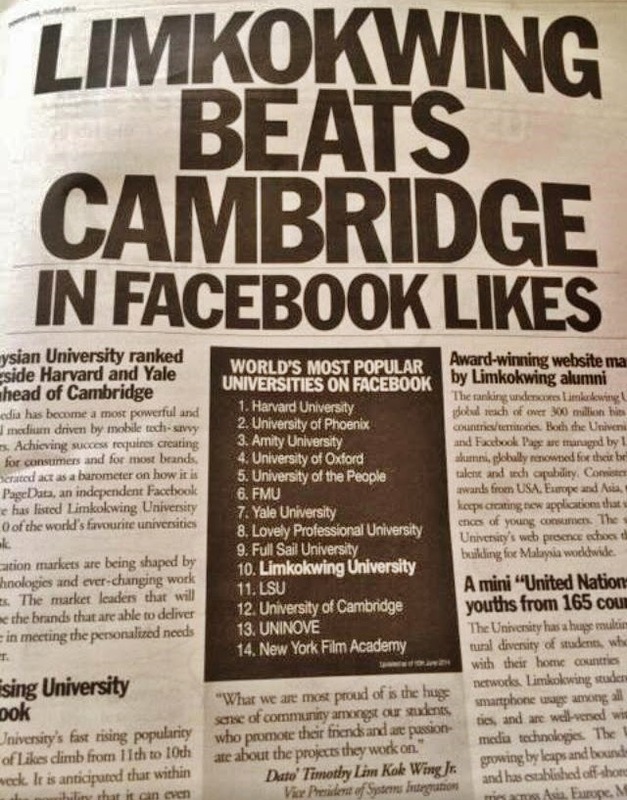 I found it amusing that a Malaysian university took pride in "beating Cambridge" in terms of the number of "likes" and touted it in press and on social media, with ambitious plans to double their total FB likes. However, the real story here is not Limkokwing University but the schools like Harvard, Yale, Oxford, and Cambridge. I found it peculiar how erratic and unpredictable the top 15 list was. Why weren't Princeton and Berkeley in that list? This inspired me to look up the sources of the "likes" for the different top colleges. Turns out that similarly to life science companies and pharmaceuticals, many colleges are paying Facebook to acquire fake likes. Very easy to tell which ones fell victim to this by looking at the number and source of the "likes"; they all match the location of the school for the universities with fewer than 300,000 "likes". But the schools that made it to the "most popular" list have "likes" from Dhaka, Bangladesh (Cambridge, Oxford, UofPeople, Harvard) and Addis Abeba, Ethiopia (Yale) . The most stunning example here is Harvard with 3.3 million "likes". Probably about three million of these are fakes. I just hope they did not pay for this, like we did on PubChase . If the cost per "like" is similar to ours ($50-$100 per thousand), Harvard might have paid Facebook between $150,000-$300,000 for fake likes . It is pretty clear by now that the problem with the purchase of fake likes, directly from Facebook, is pervasive . I just don't know the scale of this. If startups, corporations, and universities are paying for this, how much exactly is Facebook earning from the fakes? And could this revenue be the reason why Facebook consistently denies the existence of this problem and makes it impossible to delete the fake likes once you purchase them? 1. Business Insider has great coverage of the fake "likes". "Facebook Advertisers Complain Of A Wave Of Fake Likes Rendering Their Pages Useless". 2. Below are the numbers for the above graph. 3. This example makes it clear how a page can suddenly be flooded with fake likes, completely beyond the control of the owners. 4. While the fake "likes" might have flooded Harvard and Yale organically, the following posts suggest that Harvard is very proud and cares a lot about the "number of likes". "Harvard still has a ways to go to match the current Facebook page Leader—Texas Hold'em Poker has more than 53 million likes—but we are at least more popular online than our neighbors in New Haven. Only 49,171 people have liked Yale University's official Facebook page." So Yale had to catch up and grow its "likes" total from "only 49,171" to the almost million from Ethiopia that it has now. If I had to bet on it, I'd wager that both Harvard and Yale stumbled into the same problem as we did with PubChase, paying to promote their pages and getting empty fakes in return. The World = Dhaka, Bangladesh? What's the shape of a gene?